Steve Jobs is known for delivering one of the most widely viewed and quoted commencement addresses in history. His speech, at Stanford University in 2005, struck a chord that resonated far beyond the campus. On YouTube alone, the video of the address has garnered 12 million views and counting. 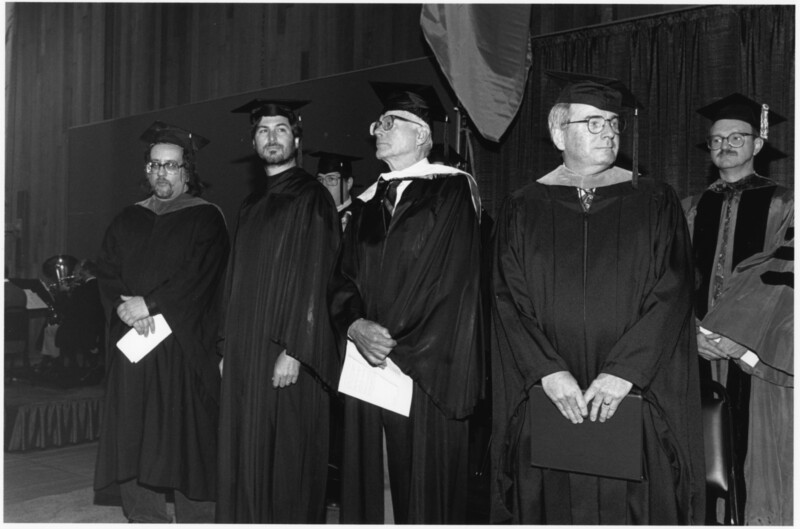 This was Mr. Jobs’s one and only commencement speech. But, as it happens, Mr. Jobs delivered a very similar speech on August 27, 1991, about 14 years earlier, at the convocation ceremonies at Reed College, his alma mater. 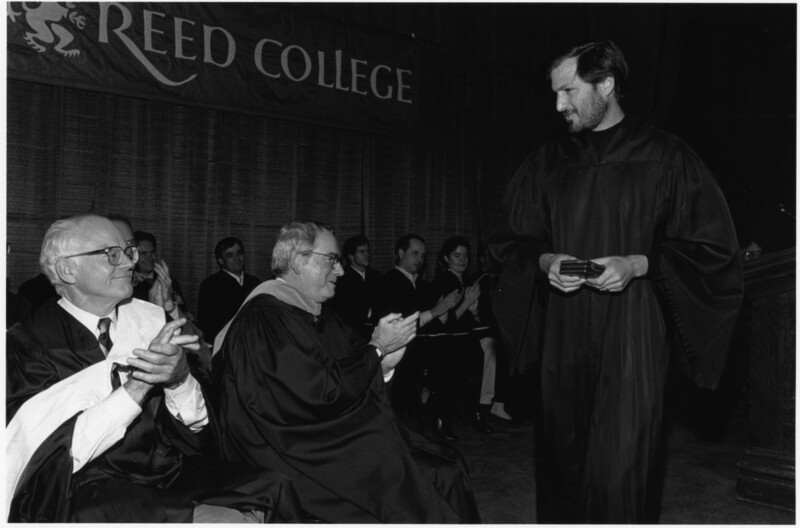 Steve Jobs accepting the Howard Vollum Award at the 1991 Reed College Convocation. To my knowledge, no video of this speech exists. However, thanks to my friends at Reed College, I am happy to share an audio recording, along with black and white photographs taken at the event and a full transcript, reproduced here with permission. The first speaker is most likely interim President William R. Haden, followed by Professor Richard Crandall who presents Mr. Jobs with the Howard Vollum Award and reads the acccompanying citation. Professor Crandall, currently the director of Reed’s Center for Advanced Computation, is a legendary Physics professor and close friend of Mr. Jobs. In this recording, Steve Jobs’s speech begins at 8:27. Clicking the link will launch your audio player. 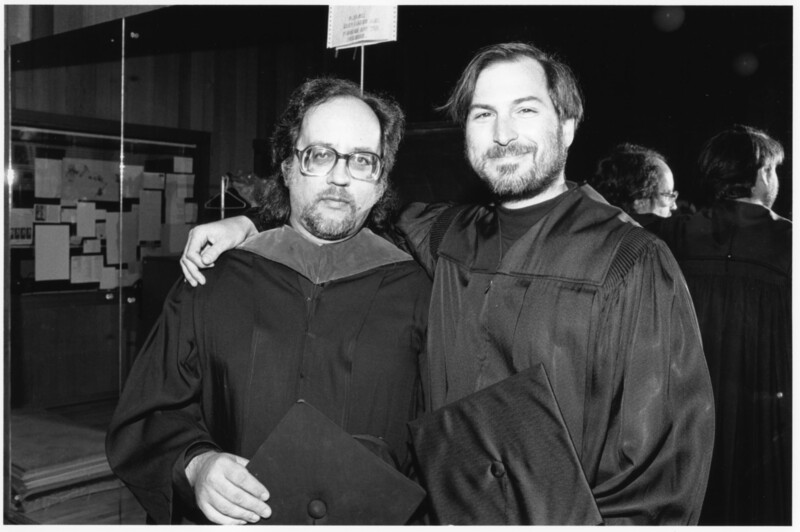 Steve Jobs with Professor Crandall. At Reed, all three stories focus, not surprisingly, on his two years at Reed. He mentions the value, later in life, he drew from Reed’s liberal arts curriculum. He also describes, in colorful detail, a lesson in situational ethics and appreciates the selfless generosity of Jack Dudman, then the Dean of Students. But the strongest thread woven through the speech is the hunger he experienced during his college years. Obviously, in 1991, he had not yet been diagnosed with cancer and the sting of exile from Apple was still fresh, making it a topic Jobs would not have been comfortable highlighting, at least not until he was given his chance at redemption. Steve with a mortar board. His Reed address was delivered during the “wilderness years,” the time after Jobs was forced out of Apple but before he turned around his fortunes at NeXT or Pixar. It wasn’t a complete disaster: at Pixar, he had made a distribution deal with Disney earlier in the year but that partnership would not bear fruit for several contentious years. At NeXT, the future was significantly less certain. At home, however, things were looking up. He married Laurene Powell a few months earlier, on March 18, 1991. And, about a month after the Reed Convocation, on September 30, 1991, she gave birth to their son, whom they named Reed Paul Jobs. Not, we’re told, in honor of the college but because the name sounded good. Thank you very much for this. It means a lot to me. I am a peculiar Reed alumni as many of you know. I never graduated from Reed, although that doesn’t make me that unusual I suppose. But, maybe more unusual, I ran out of money after one semester here at Reed so I dropped out but then I dropped in for another year and a half, so I was actually here by choice, which was somewhat more unusual. And, I had some experiences here, that I’m sure many of you will have as freshmen and throughout your years here, that have stayed with me my whole life. I was thinking of some of them to recount to you. Remember that I’m much older than you now, in that, I’ve always thought that people’s spark of self-consciousness turns on at about fifteen or sixteen. And so, if we normalize age to fifteen or sixteen then most of you are two or three or four years old here as freshmen. I’m about twenty. So, that maybe puts in perspective what it’s like to return to Reed after so many years. But a few things stick in my mind that I wanted to pass on maybe would be of some value. The first was, that as you will be shortly, I was forced to go to humanities lectures. Seemed like every day. I studied Shakespeare with Professor Spitowsky. And at the time, I thought these were meaningless and even somewhat cruel endeavors to be put through. I can assure you that as the patina of time takes its toll, I thank God that I had these experiences here. It has helped me in everything I’ve ever done; although, I wouldn’t have ever guessed it at the time. The second experience that I remember from Reed is being hungry: all the time. The cafeteria here taught me quickly to be a vegetarian. And I didn’t have so much money so I would gather up Coke bottles and take them up to the store to find out how to eat. I discovered the cheapest way to eat was Roman meal. Have you ever heard of this? The cereal. It was invented by a Harvard professor who studied…who was a history professor. He one day wondered what the Roman legions took with them to eat as they conquered and pillaged these villages. He found out through his research that it was Roman meal and you can buy it at the local store and it’s the cheapest way to live. So, I lived for many months on Roman meal. But, also, several of us, after not eating for a few days would hitchhike across town to the Hare Krishna temple on Sundays, where they would feed all comers. And we, through practice, discovered just the right moment to arrive after their particular religious practices and right before the food. And not having eaten for a few days, we would eat a lot, and on several occasions stay over because we were not able to move. And the following morning, they would wake us up at four o’clock in the morning because it was their time to go gather flowers for their temple to honor Krishna. So, they would take us with them, pre-dawn, out into the neighborhood where they would proceed to steal flowers from their neighbors. And the neighbors that lived close to the Hare Krishna temple soon were wise to their pillage and would get up early in the morning and guard their flower beds and so they would have to go in an ever-wider circumference around their temple. And, in spending a little time with these people, I noticed some of their other behaviors. They used to sell incense to the local department stores and then go steal it back so that the department stores would buy more and they would have a thriving business. And their ethics told them that this was fine. That anything in the service of Krishna was fine. In interacting with them, I think I learned more about situational ethics than I ever did on campus. And the last experience I wanted to recount for you was there is a man, I think he’s here today, named Jack Dudman, who used to be the Dean of the school, who was one of the heroes of my life while I was here because Jack Dudman looked the other way when I was staying on campus without paying. He looked the other way when I was taking classes without being a formal student and paying the tuition. And, oftentimes, when I was at the end of my rope, Jack would go for a walk with me and I would discover a twenty dollar bill in my tattered coat pocket after that walk with no mention of it from Jack before, during, or after. And, I learned more about generosity from Jack Dudman and the people here at this school than I learned anywhere else in my life. So, I wanted to thank this community because the things I learned here have stayed with me. And character is built not in good times but in bad times. Not in a time of plenty but in a time of adversity. And this school seems to manage to nurture that spirit of adversity. And I think does build some character. So, I thank you for teaching me how to be hungry and how to keep that with me my whole life. Thank you very much. Special thanks to my alma mater, Reed College, for permission to republish these photos and audio recording. Photographs by Fred Wilson. Thanks also to Chris Lydgate and Gay Walker of the Reed College Office of Public Affairs for allowing me a peek into the archives.